As someone else noted at the weekend, “I will hold onto this covenant thought and this will truly be a blessing”. An unexpected blessing at Sunday morning’s breakfast on the beach at Carbis Bay! For the first time in all our Encounter Weekends we were provided with a wonderful shelter – a reminder, someone remarked, of God’s protective covering over us. The weather may not have been typically warm and sunny Galilee, yet we were there! “The experience I had on the beach, with the waves coming in and going out, taking all my troubles with it …..”. The House of Prayer is always a special place for us on our visits to St.Ives. Once more, the sweet Presence of Jesus filled the place, as we soaked in the ministry of His Holy Spirit. “At the prayer room I felt God released me from all the tough questions and confusion and disturbance within me”; “At the prayer room, God spoke to me about releasing anger and other things I’m holding onto”. Great thanks to John and Anne for their hospitality, wonderful care and excellent food! Looking forward to the next Encounter Weekend in 2016. DO join us, whether or not you’ve been before. 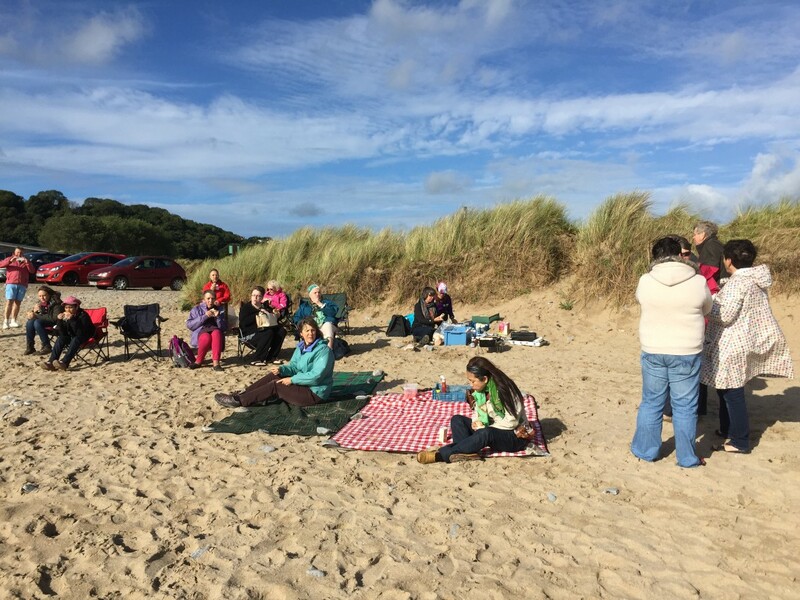 A combination of God’s healing grace and Presence, liberating truth from God’s Word, sun and warmth for the bbq breakfast on the beach, warm fellowship and excellent hospitality meant we were truly blessed at our Encounter Weekend in September, at Nicholaston House. God met with us! We thought, taught, talked and prayed about how shame affects our lives and ties us into false identities of who we are, masking or stripping away the person God created us to be. As we confronted these difficult issues, God broke through , healing years even decades of emotional and mental pain for some folk. Some experienced it at the weekend. Others realised the extent of what God had healed and the freedom He has released them into, only after they returned to their everyday routines. Some testimonies show what God was up to! K: Straight after we did all those prayers, Jesus walked with me through my life as a child. He was with me and I saw him with me in every incident where I felt totally rejected, unaccepted, unwanted, ridiculed and unloved. There were so many of them, it becomes a state of being, so that everything is always coloured in that way…even times when it was never mean to be. But this time, as Jesus and I went through my childhood, I felt loved and accepted and it was beautiful. Jesus rewrote my whole history for me – with me – as accepted and loved, in every single moment with every member of my family and moment of my childhood. It was very lovely. … I’ve always felt like my skin was being whipped when people accused me, criticised me or said evil things against me. Now I know that I don’t have to take the whipping. Jesus took it for me. (Jesus was whipped by Pontius Pilate before being crucified. The prophet Isaiah, 600 years earlier said, “by his stripes we are healed”). D: It has been a weekend of tears and laughter and God has done some amazing things. I’m going home feeling free and excited about what God is going to do with me next. H spoke of God rolling away years of isolation and bitterness and being reconnected into His love. Others found beauty, refreshing, strengthening and fresh hope as God met with us. Thank you to everyone who joined us and made this such a special time. Thank you to the Lord for His Presence, that made ALL the difference! wanted to make the time to gaze on him and experience his gaze on us. We were not disappointed! Simply to say that Father met with us, is rather like saying, “We stood under a waterfall and got a bit wet!” What’s it like to bring ourselves into the torrent of grace and love that flows from his heart? –xxxan amazing answer to one person’s practical and deeply felt needs, through someone they’d not met before, yet who came (unknowingly) equipped with the detailed and exactly right answer: that can only be Father God! –xxxa lady came, suffering from acute pain – a consequence of 30 years of scoliosis (curvature of her spine). She was permanently on Tramadol, a narcotic like pain reliever. She had tried every remedy, with no cure. The Holy Spirit revealed that she was bound in her affliction by an evil spirit, like the lady in Lk13:10. The word of deliverance was spoken over her and she was set free from 30 years of pain and disease. She was up and bending over to touch her toes and tying her shoe laces, all for the first time in over 20 years! Hallelujah! Our Father is so good! And we were hugely encouraged, too, to have confirmed that a lady who attended the Nicholaston weekend in September (and this one) was freed from OCD that had meant a repeated compulsive behaviour that was interfering with her daily life and making a chore out of many normal activities during any day, for over 30 years. She needed constantly to check and recheck that everything in her apartment was secure and it was an ordeal every time she went out. When she returned home from the September weekend, it suddenly dawned on her that the Lord had delivered her from this compulsion. At the Mustard tree she testified to how she had enjoyed a month of “normal” behaviour! “I sought the Lord and he answered me; he delivered me from all my fears … taste and see that the Lord is good”, said David in Ps34:4,8. So many of the folk from these last two weekends, at Nicholaston and the Mustard Tree, would say a big AMEN! And certainly we would add, “The Lord has done great things for us and we are filled with joy”. I received a healing a week ago that has made my life so much more pleasant! Since the age of 17 I have had trouble with my wisdom teeth. One in particular that apparently could not come through because there was no room. The hospital did not want to try and extract it because it was too high in the jaw. The dentist hoped that it would come down enough to be removed. I have had endless pain and infections over the years, a very bad one recently that was the worst the dentist had ever seen. This was part of my problem over half term. I could not open my mouth to eat. Pain killers had little effect. As I lay in bed last Thursday feeling sorry for myself because I had no one to pray for me at that time, I thought of Conrad and his assertiveness regarding healing. In particular I remember him saying that you need to claim your healing- the healing you are entitled to, so I thought that I would pray for myself and do exactly that. I fell asleep and woke up with a big white glistening wisdom tooth in the right place! How great is our Father God! Podcasts of the weekends’ teachings can be downloaded from here. What an awesome God we have! 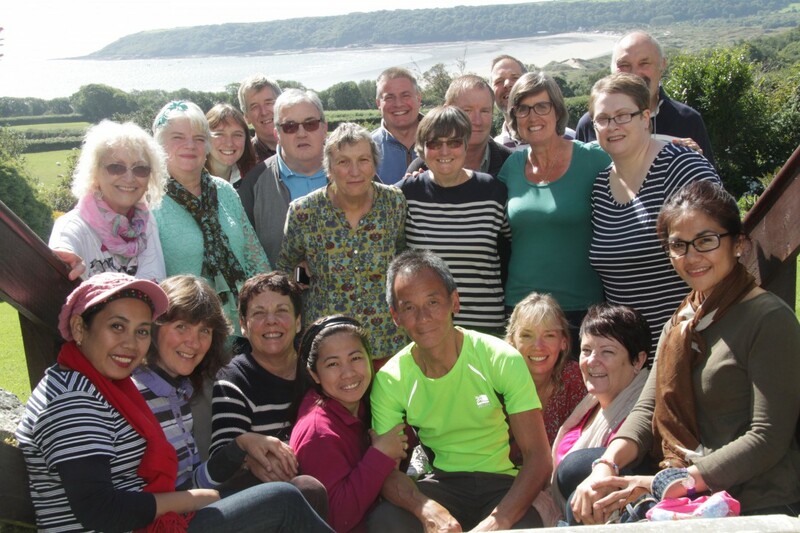 During our Encounter Weekend at Nicholaston House we experienced the gentle but deep power of the Holy Spirit. “In quietness and trust is your strength”, the Lord spoke through Isaiah (30:15) and so it proved for us. There was no drama and yet there was plenty. For one, a deep move of God in their being, that could barely be spoken about and continuing and deeper encounters with Jesus through the weekend; for some others, removal of a lifetime’s baggage; for another, healing of deep wounds and the “making good” of what had been lost in childhood; for many, an enveloping assurance of father’s love and the joy and freedom of the Holy Spirit; and for one, a very special moment of receiving Jesus as Saviour and Lord. Some spoke of the Word that was taught, piercing their hearts and speaking directly to their lives – only the Holy Spirit can do that! For the casual observer, there was nothing out of the ordinary to describe the weekend because everything, in many ways, just went ahead normally. Yet who can fathom the mind or works of God? It is the testimony of the lives that were being deeply transformed by the Spirit, that speak the truth of what HE was about. We just stand back in awe and thankfulness and give HIM the praise and glory. These are, indeed, extraordinary times. And we are seeing our God at work, not just in the spectacular and visible manifestations but also in the depths of the “engine room” of peoples’ lives, where he’s restoring freedom and abundant life and reigniting a revival of enduring passion for him. Perhaps what sums up the weekend for us is the experience of one of our number, who arrived quite late on Friday evening, after a 4 and a half hour drive. She arrived, in her own words, in a “very bad mood”, even as she drove up Nicholaston’s drive and approached the front door. As soon as she walked in the door to the empty entrance lobby, she says, she was met with such a strong sense of the presence of Jesus, that it changed her instantly! We do remember that when she found us in the room we were in, we did wonder that she seemed in remarkably good spirit, for the journey she had just done! And that was just the start of God’s blessings for her. God is good! And he’s awesome! Lord we want to thank you, for the works you’ve done in our lives. Thanks to all who stood with us in prayer. Paul’s words from 2Cor1:11 certainly resonate with us: “Many will give thanks on our behalf for the gracious favour granted us in answer to the prayers of many”. The first Encounter event for 2011 took place on 12 February. The Lord’s presence was with us as we worshipped and received Jesus’ promise that his truth will set us free. It was a morning for breaking free from burdens we’d carried within ourselves, locked in by the enemy’s lies. It was a time for embracing God’s promise of restoring what was lost. Joel 2:25 gives us a promise of restoration – of bringing us back to the places where we will dream again. Not dreams of yearning for what was not, but dreams of fulfilment and hope. In Jos24:13, Israel is reminded that they acquired what they had not laboured to build. God didn’t just give them victory, he gave them a readymade conquest. This is a picture for us not just of the victory we have in Jesus, but that this victory includes the totality of God’s healing and restoring of our lives. The promise of Joel and the picture of Joshua assure us that God alone can bring us to the place of fulfilment, where what we lost is not just paid back, but paid back with interest. When we stand in the place of God’s healing and restoring, we find that what we lost hasn’t held us back and in fact God has grown us so we are where we should be – if not even beyond that – had we not suffered the loss. So it’s like having our youth renewed AND soaring with the eagles. The problem for us, so often, is that we live locked within the consequences of hurtful and damaging experiences of life – consequences that leave us with a burden of losses that we feel we will carry for life. Not just material losses, but loss of peace, health, character, self worth, innocence, abilities, relationships ….. The reality appears to us to be anything but the promise and the picture. We appeart to live in the opposite realm, where we are slaves to the consequences from the past. What keeps us bound and unable to experience God’s healing and restoring? A major factor is the lies of the enemy. Jesus called satan “the father of lies” and so identified a key weapon he uses. Because Jesus is Truth and he sustains all creation, truth is part of our essential DNA. Truth is ingrained into our very being. We are designed to be held together by truth – it is like a thread that keeps us together and aligned with what is right and good for us. We live in wholesomeness, balance and fulfilment when we live in truth. So when we embrace lies and accept lies into our beings, the result is an unravelling of our personalities, poisoning of our spirit and even destruction of our bodies. No wonder that satan uses lies to undermine us in every way he can, to steal, kill and destroy all he can. No wonder he will keep us chained to lies that seek to convince us that we will never be free from damaging consequences arising from losses and bad experiences we’ve had in life. How can we be free, to experience God’s healing and restoring – to know the reality of the promise and the picture? The first step is to recognise and acknowledge the lies that we have accepted and chosen to believe. Because lies don’t just stick. They stick because we choose to accept them and believe them. We may then need to repent of any wrong attitudes we have held towards God as a result of accpeting the lie (e.g. not trusting him; not accepting his goodness). We need to renounce the lies (i.e. refuse to recognise them any longer; stop engaging with them). And then receive and affirm God’s truths for us. It is not necessarily easy. And the longer we’ve lived with the lies, the more they will seek to hold onto us. So we will at all times need the Holy Spirit’s revelation and enabling strength. But if we are willing, then he is certainly more than wanting (to free us) and is able to do more than we could ever imagine. Jesus said, “So if the Son sets you free, you will be free indeed”. You can listen to a podcast of teaching related to this topic, from the Encounter Morning of 12 February. Click here. Use the Contact form or Comments (below) to request a CD – don’t forget to give us your name and address. Join us in 2019, for an extended weekend in July, that could significantly transform your relationship with Jesus. Easter 2015: Normal or Abnormal? Breakfastdiary on Easter 2015: Normal or Abnormal? cheryl osborne on Easter 2015: Normal or Abnormal? mildred bowman on Easter 2015: Normal or Abnormal? Enter your email address to follow new Breakfast posts and receive notifications by email.